Click the image for more #LEHorrorOctober posts. Alright, alright, I confess that that line has fooled me on many occasions and I don’t like to speak much about it or at all. So why am I doing this? Because creepy books are my guilty pleasures. I’m not kidding. I pretty much went straight from reading sweet little kid stories by Enid Blyton to R. L. Stine. His Fear Street and Goosebumps series were fodder for a 12-year-old me. I did try watching horror TV shows and movies but failed horribly (see what I did there). I go from normal to freaking out under sixty seconds just because a scary thought creeped into my mind and BAM! Two of my friends have been pushing me watch Evil Dead and I might cave in but who knows, right? Right. 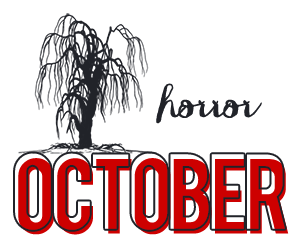 So when Leanne from Literary Excursion had this thrilling idea for Horror October, I was all over it. I’ve somehow lost touch with the horror genre as I grew up and I’d like to finally catch up. – I love Frankenstein by Mary Shelley. I’m fascinated by the monster. Yes, I’m weird. – If I ever do dress up on Halloween (we don’t celebrate it), I’d totally dress up as a Gryffindor first. Rules of being a Potterhead and if you don’t agree then Avada Kedavra! – I like blood and gore but too much of it disgusts me which is why I wonder how on earth did I ever want to become a brain surgeon. (I still do. Clearly I’m deluded and sad). – Sinister looking jack-o’-lanterns creep me out. So do those scary-looking rubber masks. Ew. Oh, the Horror of Reading Horror! I’m pretty satisfied with my list and more than ready to begin. It’s not all about me reading. I’ll be posting all sorts of horror posts. – Essentials of Horror: Be it the undead or the living dead, there are certain elements that have to be present to make any book a horror book. 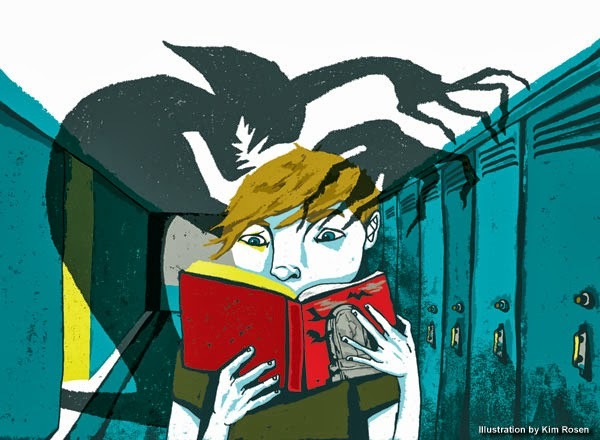 – Horror in YA: What do YA readers like to read when it comes to horror? – Books about Horror on Deserted Islands: Such books are pretty much staple when it comes to horror but the good news is that they never grow old. I’ll also be talking about why are settings important. 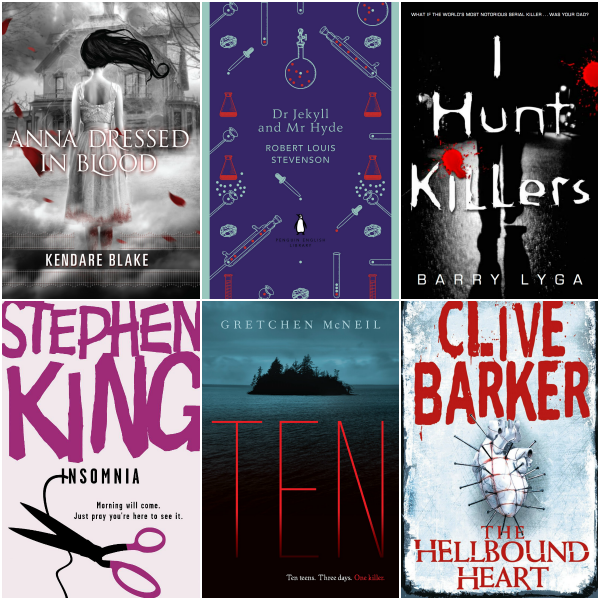 – Top Ten Tuesdays the Horror Editions: From scary-to-look-at book covers to scary character names, I’ve got it all covered. – Book Reviews: First one up is Something Strange and Deadly by Susan Dennard. If you are going to watch Evil Dead, prepare to be freaked out. The remake is so much better than I though it would be! The original is still fantastic and has its creepy moments as well. Both have some funnies (at least for my sick sense of humor) and both are thoroughly enjoyable. I hope you do watch it, and get a good experience out of it! I love your confessions! I have only read one Stephen King book and it wasn't even horror (The Eyes of the Dragon). Those rubber masks creep me out sometimes too, and my imagination always makes me think scary jack-o-lanterns are going to turn into Pumpkinhead and smoosh me. I've been away from horror reading far too long myself. AND OMG I AM FANGIRLING! You're going to read The Hellbound Heart too! 😀 I should manage to work both that one and This Is Not a Test in this month so it will be interesting to compare notes. Looking forward to everything on your blog this month! I started reading The Shining last week … haven't had much time for it yet, but I'm eager to see if it actually creeps me out. I have the WORST luck when it comes to horror in books. Have fun with all your scary reads! I Hunt Killers is a good one! I got an ARC of it last year. LOL. The good thing about reading horror books is that it's less scary, in my opinion. I'm like you in that I can't watch a scary movie without at least one pillow, but with a scary book, it's totally different! I can't explain it. Maybe it's just because I'm not imaginative enough? Aw, goshdarnit. I wanted to be magical. And ooh, if you ever watch Evil Dead, you better tell me all about it! One of my friends said that it was the scariest show they'd ever watched, so I'm pretty intrigued. I mean, scaring yourself is fun, even though you suffer the effects later on. Great reading list, too! I haven't read any of the ones you listed down, but ANNA and TEN and DR. JEKYLL are very high on my list. So is THE SHINING and IT by Stephen King. I've heard that those two are the scariest. Looking forward to all you have in store for us, Sana! I can't wait to see your Horror in YA. Oooooooh! I LOVED Anna Dressed in Blood. And right now i'm loving I Hunt Killers! I hope you'll like them. And how come I forgot about Leanne's Horror October? Dammit! Anyway… are you liking Something Strange and Deadly? I have it and I was thinking about reading it soon. OOhhh looks like a lot of great posts coming up! Can't wait to see them! I haven't read any of the books you have on your reading list, but Anna Dressed in Blood has been on my wishlist FOREVER! Oh, and don't feel so bad about not having read a Stephen King book. I've only read one, and I can't even remember what it's about or anything. I am pretty sure it had a dragon eye on the cover or something… But yeah. Maybe I'm making it up? I think the only horror experience I really have is with RL Stine – not his regular books but those Choose Your Own Adventure ones. I LOVED those. If you have a copy of one at home, I vote for you to read it! Ohhh Sana! This is so cool. I've secretly always wanted to do an entire themed month on my blog, but have always been entirely too lazy. So really, props to you! This is exciting – can't wait to see what you have in store! Oh-em-gee GOOSEBUMPS!! I used to go crazy for Goosebumps. And Are You Afraid of the Dark. I don't really know why I was so into these shows because I was like you and would get totally freaked out by them. You know, I still have not read a Stephen King book either… that must be considered some sort of crime in the book world. I bet The Shining is terrifying! Man, if only I had time this month to read the books from your reading list – ANY horror book! As it is though, I think I'm going to have a hard enough time fitting in my regular review books – boo. "Rules of being a Potterhead and if you don't agree then Avada Kedavra!" hee!